Send automated Text Messages, beautiful emails, & the Pizza Tracker for Title™ to help drive your business forward & save you time (60-90 min/file). 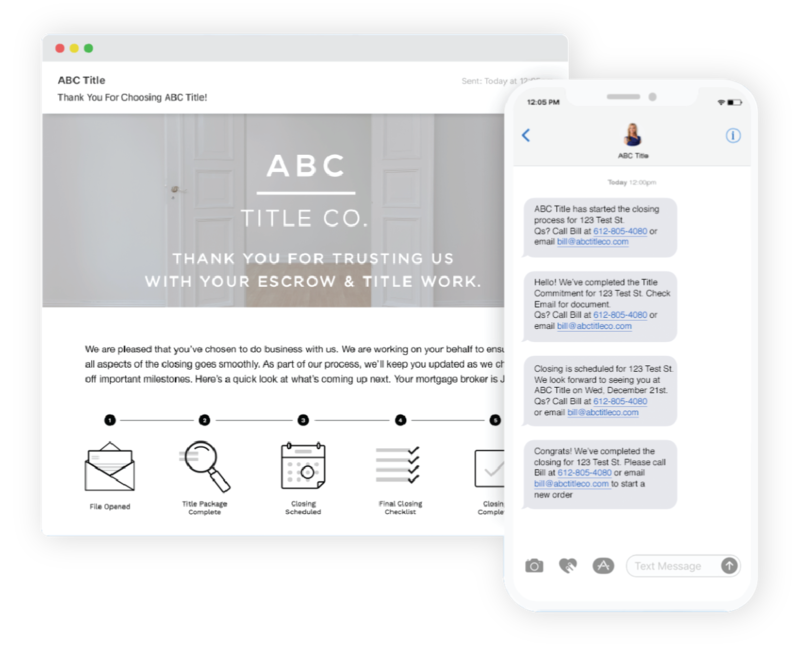 CloseSimple makes it really easy to send email and text message updates to Realtor, consumer, and lender customers ensuring everyone knows exactly what has been completed and what's coming up next. 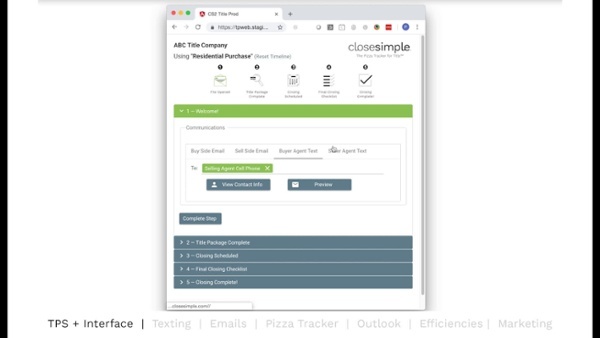 Give your customers peace of mind with the Pizza Tracker for Title™ from CloseSimple. Send personalized email updates, including our Pizza Tracker for Title™ to help drive your business forward and save you time (saving 60-90 minutes per file). Download our 5 email templates now. Seamlessly integrate with Ramquest, Resware, Softpro, and GreenFolders to automatically pull all of your customers data. No more double data entry. Don't see your integration? We're always working on including more. Drop us a message to let us know what you'd like us to integrate with next. Send a personalized text for each step in the process. Reach your customers exactly where they are - their phone. 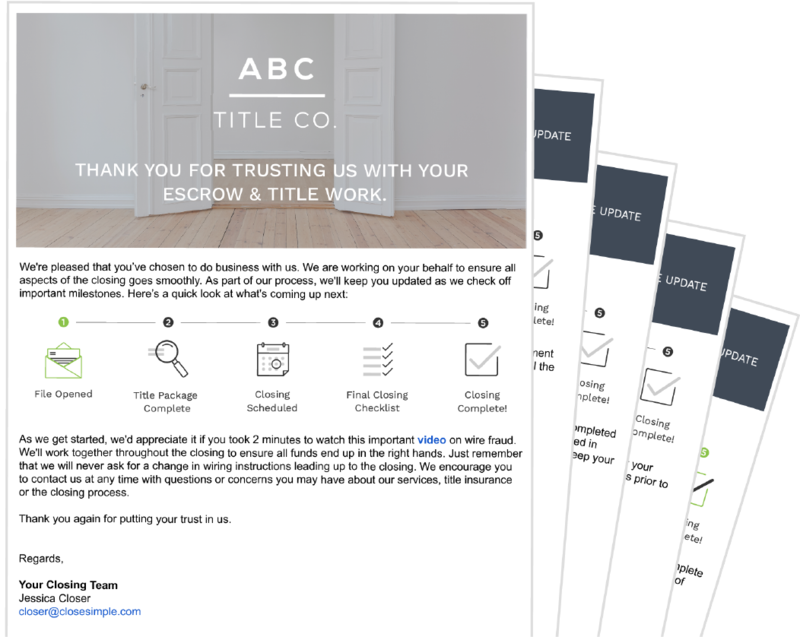 Send customized emails that feature your branding & The Pizza Tracker for Title™ Timeline. Integration with popular software means Zero Double Data Entry, and more time saved for you. On-boarding typically takes less than a month. We design your emails, including branded assets & timelines. Get your own Pizza Tracker for Title™ with the milestones that align with your process. Time saved in the closing process means refocusing time on the things that matter most to your business: growth. We help you make an impact on your business, and your bottom line. Our best customers take screenshots of the CloseSimple emails and texts into their new broker meetings, show them the experience they will be getting with you, and they walk out with new deals. "With escrow staff in eight locations, consistent, uniform communication with our clients is critical to our success, CloseSimple has provided us a platform to ensure delivery of that communication in a manner that comfortably fits within our process and enables us to keep buyers, sellers, agents and lenders informed and engaged throughout the life of a file." Contact us to talk about pricing and the next steps. Please submit a form to get the conversation going. We'd love to talk with you about what a CloseSimple implementation could look like for your business.